ballots will be mailed Monday. Still waiting for official results. But, I've heard Phillips was number one in the presidential election, followed by Borg. There will be a runoff between the two. I haven't heard about eboard elections, or the ballot propositions. I'll post it all when I have it. NARRATIVE: On 12/1/06 at 5:55 P.M. the Spokane Fire Department responded with 3 engine companies, 2 ladder companies, a rescue unit and two battalion chiefs to a reported house on fire located at 1908 W. Dean in the city of Spokane. First in fire crews found a home that was well involved in flames on the second level. A rapid entry was made to search the structure for anybody still inside. At the same time hose lines were advanced to extinguish the fire. All occupants were not at home at the time of the fire and the fire was successfully extinguished in approximately 30 minutes. The tenant who lived in the house will be staying with a friend. The cause of this fire is unknown at this time; however it is currently under investigation. A total of 20 firefighters responded to this fire. There were no injuries to firefighters or civilians. DAMAGE EXTENT: Personal belongings, carpeting, walls, floors and ceilings. Smoke and water damage throughout the structure. NARRATIVE: On the evening of November 30th at 9:58 the city of Spokane Fire Department responded to 2515 East Upriver DR to a reported structure fire. E8 reported smoke and flames showing as they were approaching. Upon arrival E8 reported a one and a half story wood frame house fully involved in flames, it was confirmed that all occupants were out of the structure. Hose leads were placed to cover exposures and attack leads were advanced to the interior. A search was conducted to make sure that everyone was out and accounted for. The main body of fire took about thirty minutes to knock down, overhaul and final extinguishment was completed in about two hours. Cold weather and ice made it difficult for Firefighters to work. There were no injuries reported. A family of five that were displaced is being assisted by Red Cross. Initial response to this alarm brought five engines one ladder one rescue and two command vehicles for a total of twenty four fire personnel. A fire watch was kept on scene through the night. The cause of thie fire has not been determined; investigators are on the scene today. NARRATIVE: At approximately 0220 hours on November 29, 2006 the Spokane Fire Department received a 911 call for a reported house on fire at 5802 S Meadow Lane. Six fire apparatus consisting of 2 Ladders, 3 Engines and 1 Rescue vehicle responded to the fire. This residence is located in an area that some distance from city fire hydrants so an additional fire apparatus from Fire District 8 was requested to Tender Water. Access to this residence was provided by a gravel road approximately 3/4 mile off the main road (Meadow Lane). This access road was uphill and covered with snow and ice. Responding Fire Officers anticipating problems with the road requested 3 additional "four wheel drive" Brush Engines to negotiate the road. The "four wheel drive" vehicles were used to shuttle equipment and Fire Fighters up the road to the fire. The first crews to the home reported fire in the walls behind the wood stoves on the first and second floors. These walls were covered with stone and brickwork slowing access to the fire. Hand tools carried up the hill by the Fire Fighters were used to force open the masonry walls. Garden hose lines belonging to the home owner were used to knock down the fire until hose lines from the Brush Engines could be brought into play. The home owner also provided the ladders and tools he had on site for use to the Fire Fighters. His efforts lead to a positive outcome in the extinguishment of this fire. There were no injuries to any of the residents of the home. The residents were not displaced from their home. The fire cause is still under investigation at this time. Early indicators are pointing towards the area around the wood stove. DAMAGE EXTENT: Exterior wall on the first and second floors. 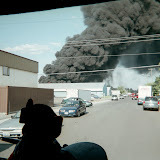 NARRATIVE: Today, November 29, 2006, the Spokane Fire Department responded at 5:13 AM to 1303 East Illinois. The first fire crews on-scene reported smoke showing from the front door of the structure and from the eaves. Firefighters discovered fire in the attic of the residence above the kitchen and an aggressive interior fire attack was initiated. The fire was brought under control within 30 minutes and there were no injuries to the occupants or firefighters. PROBABLE CAUSE: The cause of the fire is under investigation by Investigator Tom Oliver. DAMAGE EXTENT: Fire damage was confined to the kitchen and attic space with smoke damage through out the structure.